Inspired either by the recent heat wave or their own residual streams growing cold, boy band 98 Degrees has reunited. 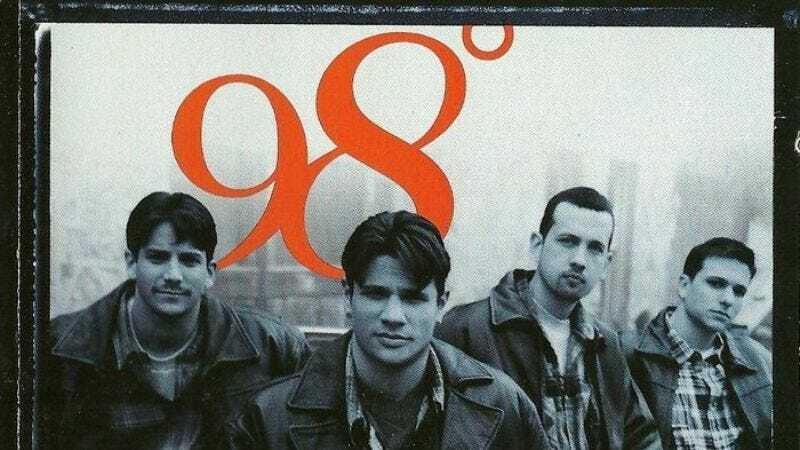 The group had its heyday around the turn of the millennium with minor hits like 1998’s “Because Of You” and 2000’s “Give Me Just One Night (Una Noche).” The band—which was nominated for a Grammy, believe it or not—is made up of brothers and ex-Simpson clan members Drew and Nick Lachey, Occupy protestor Justin Jeffre, and Chippendale dancer Jeff Timmons. The group’s planned return to the stage is a little underwhelming so far, with only two dates scheduled: Aug. 17 on the Today Show and Aug. 18 at the MixTape Festival in Hershey, Pennsylvania. But the fully waxed quartet is in the studio working on a new record, so expect shirtless harmonizing at fine malls across the nation in the near future.